Annabel Frearson reads Sic, a paragrammic rewriting of Mein Kampf by global micro workers, as a critique of contemporary fascism. A paragram is a verbal play that reorders the letters of existing words and phrases. Thus, Sic intends to undermine Hitler’s text by rendering it deviant and to liberate the language contained therein by quite literally rewriting history. Sic enacts a material textual violence through an absolute dissolution of the original narrative and regurgitation as heterological mass comprising anagrams, disjunctive sounds and unspeakable interminglings of lettristic parts, rendering the antisemitic as antisemantic. The readings are recorded in a variety of contexts so as to re-entangle the liberated language with the material world. 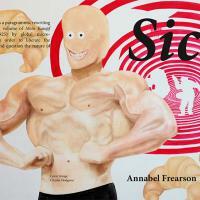 Interview with Annabel Frearson by Knut Remond. Limited edition audio cassette, 8 copies numbered. Available at 'ohrenhoch, der Geräuschladen' (and to hear on headphone in the ohrenhoch archive). My artistic practice is interdisciplinary, with a focus on expanded, conceptual art writing. I work with historically significant cultural objects, such as texts and films, through which I explore contemporary theoretical and socio-political concerns. • Sic: commissioned by the International Literature Showcase (ILS), co-funded by British Council, Writers Centre Norwich and Arts Council England, comprising a paragrammic rewriting of Mein Kampf (Hitler 1925) by global micro-workers through online gig-economy platforms, as an exploration of contemporary fascism. • Affectation Correspondence, Tombstone Press, 2017: A work of science fiction written using only words from Frankenstein (Shelley, 1831). Exhibitions and projects have featured at: Camden Arts Centre, LUX/ICA Biennial of Moving Images, V&A Museum, Whitechapel Gallery, IMT Gallery, xero, kline & coma, London; Arnolfini, Bristol; Ikon Gallery, Birmingham; Haifa Museum of Art, Israel; ohrenhoch, Berlin; Shiraz Artist House, Iran; Golden Thread, Belfast; and Sheppard Fine Arts Gallery, Reno, USA. I studied modern languages at Bristol University and fine art at Central St Martin's (UAL) and the Slade School, UCL. In 2014, I completed a PhD in art practice at Goldsmiths, University of London. I teach art and critical studies at: Imperial College London; Goldsmiths College; Kingston University; Sotheby’s Institute of Art.